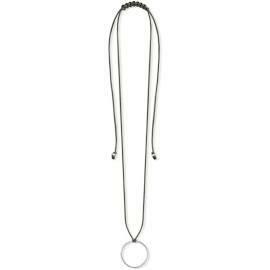 From Thomas Sabo is this stunning Grey and Silver Adjustable Cord Necklace. A perfect necklace to wear with any outfit. The Thomas Sabo Grey and Silver Adjustable Cord Necklace features a Grey cord which is adjustable at the top of the necklace. The pendant is an open work circular design which gives the necklace a glamorous edge. This necklace would be the perfect gift for her. The necklace is crafted from 925 Sterling Silver. It has an adjustable cord.